Construction of the project was completed in July 2012. The plant began operations following its official inauguration in October 2012. Protests against the dam focused on the potential damage to vegetation and bio-diversity. The tourism industry may be dramatically affected. Bujagali Falls is just one of several hydropower plants along the upper part of the White Nile. 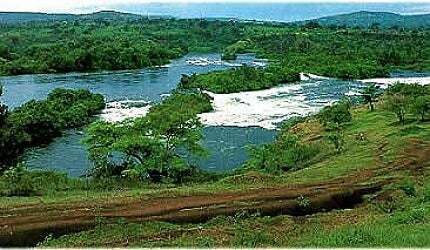 The 250MW private hydroelectric power plant project at the Bujagali site in Jinja, Uganda, finally broke ground in August 2007, after a long delay. AES Corporation (US) and Madhvani International (South Africa) were due to develop the project, known as the Nile Independent Power Project. Original plans were for the hydroelectric power plant to use four turbines sited on a rockfill dam. Construction of the project was completed in July 2012. The plant began operations following its official inauguration in October 2012. It consists of five 50MW turbines, commissioned in phases between February 2012 and June 2012. The project cost estimate has been revised from $530m to $900m. As many as 2,000 jobs were created during the construction of the project. Bujagali Energy will operate the plant for a period of 30 years, after which it will be transferred to the Ugandan Government. "The power plant is situated 1,100m above sea level at Bujagali Falls, about eight kilometres north of Lake Victoria." Construction was initially scheduled to begin in January 2003, but was delayed after vocal protests by environmentalists and residents of the area. The World Bank Group also withheld its financing after corruption investigations by the US Justice Department and by the World Bank’s Fraud and Corruption Unit. In 2003, AES announced that it was pulling out of the project for economic reasons. In February 2005, the Ugandan Government announced it will go ahead with the project despite its problems and drawbacks. Construction was launched in June 2007 through a public private partnership. The public partner is Uganda Electricity Transmission Company Limited (UETCL). The private partner, Bujagali Energy Limited (BEL), was chosen through international bidding. BEL is a special purpose company set up by affiliates of the Aga Khan Fund for Economic Development and Sithe Global Power. Salini Costruttori, an Italian construction company, was the EPC contractor for the project. The power plant is situated 1,100m above sea level at Bujagali Falls, about eight kilometres north of Lake Victoria, the source of the Nile. The low-pressure river power plant will have a vertical drop of 30m and total installation capacity of 250MW. The main element of the project is an earthfill dam. The volume for this is 750,000m³. The plant also has a power station with five Kaplan turbines and a spillway with gates. Other elements are a 97km transmission line parallel to the lines of Kampala and Owen Falls, connecting to a new substation at Kawanda. The Ugandan Parliament approved the project in 1999 after a year-long debate. IFC was head of the financing institutions, which also included the World Bank, IDA, African Development Bank (AfDB), Deutsche Entwicklungs Gesellschaft (DEG), West LB and various institutions for export credit. The Norwegian Guarantee Institute for Export Credits (GIEK) had, in principle, consented to give security. The Guarantee Institutes of Sweden, Switzerland, Italy and Finland were also positive about the project. Approval by the IFC and the World Bank was a prerequisite for further involvement by the guarantee agencies. The Uganda Government sanctioned a $75m bridge fund for the project to take off. The World Bank Group had committed $275m. The European Investment Bank sanctioned a $136m loan. Commercial debt was approved by Standard Chartered Bank and Barclays / Absa Capital. The project was funded by Industrial Promotion Services (Kenya) and SG Bujagali Holdings, an affiliate of Sithe Global Power. About 97% of Uganda’s population does not have access to electricity. Uganda’s power shortage is the single greatest obstacle to the country’s economic growth. The demand for electricity is growing rapidly. The power shortage in Uganda, when the project was planned, was 80MW a day. The capacity in 2002 was around 380MW. There was much protest about the dam. There were complaints that the project was not subjected to competitive bidding, and that locals will anyway not be able to afford the electricity it produces. "The power shortage in Uganda, when the project was planned, was 80MW a day. The capacity in 2002 was around 380MW." It was feared that when the plant was built, the falls and islands will be submerged. Vegetation and bio-diversity will be lost, including crabs, birds and trees characteristic of the area. The tourism industry will also be dramatically affected. Bujagali was a Category A project according to IFC’s Procedure for Environmental and Social Review of Projects. This was because it might cause "significant adverse environmental and / or social impacts that are sensitive, diverse or unprecedented". The World Bank eventually approved a number of measures to address the utility and sustainability of the controversial project, after a bank inspection panel raised a number of concerns. Bujagali Energy Limited submitted a Social and Environmental Assessment of the project to the Ugandan Government and prospective lenders in December 2006. The report was approved in April 2007 following a comprehensive review. The Baguari hydropower plant, which is located on the Doce River in the state of Minas Gerais, Brazil, was inaugurated in October 2009. The Dong Nai 3 and 4 hydropower projects are located in Lam Dong province, north of Ho Chi Minh City.